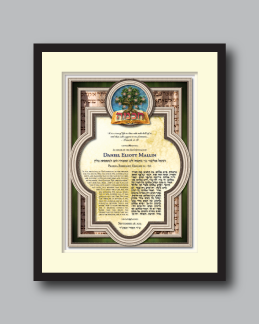 Personalized Bar or Bat Mitzvah Art :: "Tree of Life"
This B'nai Mitzvah art is aptly called "Tree of Life". The outermost portion of the design depicts a field of green, symbolizing the source of life and spiritual sustenance provided by our divine Creator, Hashem. 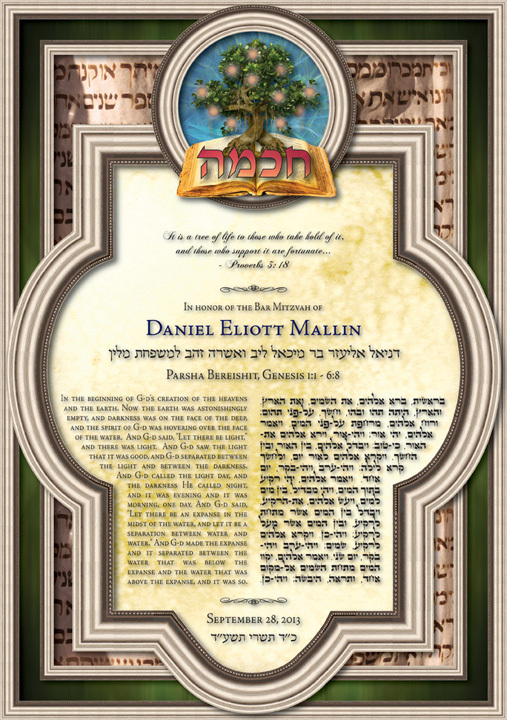 Overlaying the field of green and separated by a silver border is are the ancient hand scribed words from the torah. They are literally the source of our strength and guide us in our lives. At the top of the design, within the circular silver window, appears a sacred ancient book of knowledge. A majestic tree with orbs of light seemingly grows out of the book. The Hebrew word for "wisdom" appears in the foreground. Within the text area of the design, above the name of the B'nai Mitzvah, is the following inspirational quote from Proverbs, "It is a tree of life to those who take hold of it, and those who support it are fortunate". 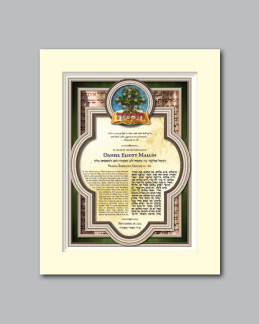 These words, along with the imagery of the tree of knowledge, are meant to inspire the Bar or Bat Mitzvah boy or girl to remember that the source of all life and meaning is through Gd, and a life filled with Jewish learning will sustain them all their lives. After making your selection from the options below, please click on the "Bar Bat Mitzvah Information Sheet" button to complete your order.